This project has been on my mind since the very first time I attended a concert from ‘Institut fuer Feinmotorik’, a Germany based ‘Band’ which is using turntables in a pretty uncommon way in order to generate sound and noises. What struck me most about their show (besides the fascinating sound) was that you could actually follow the objects they were laying out on the turntable platter, and visually experience the sound generation. I would describe this as visual (or mechanical) sequencing, and in a live performance very much self explaining. In fact you can correlate the produced sound to the actual object generating it. Compared to the average laptop-act, here you get an insight on the performer’s work and it is quite fun to watch and follow the soundmaking object moving. 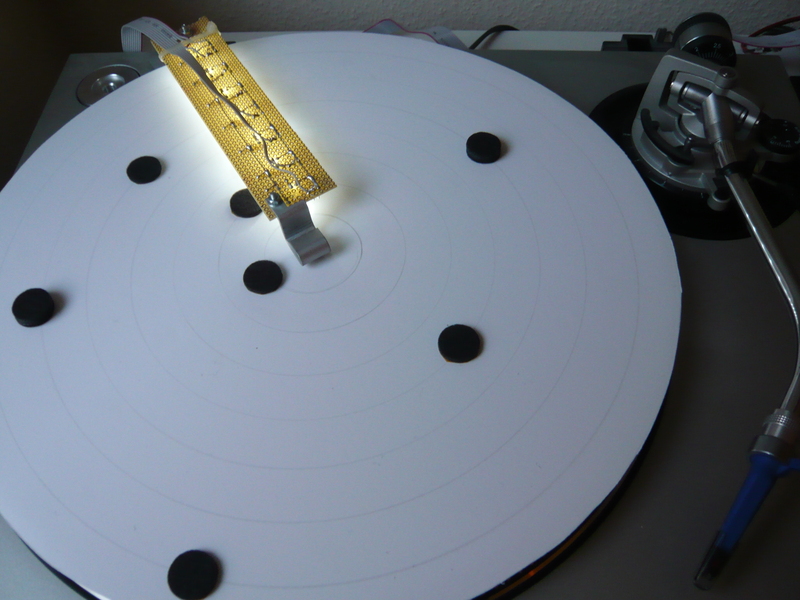 From there, I came up with the plan to build a sequencer in a similar fashion, using a turntable with a white slipmat, on which one would layout a sequence in form of some black dots as input to an optical scanner, which would then generate midi events each time a black dot would pass that scanner. Since then, some time has passed but I eventually came up with something. Lately, I tried out the Microchip HITEC C compiler (in Lite mode) for PIC microcontrollers, in order to prepare something for a larger project and I needed something easy to code in order to get used to the compiler and that’s how the TurntableSequencer got born. I am using a PIC16F88 uC which has 7 AD converter inputs and integrated USART, which makes it rather appropriate for this type of application. 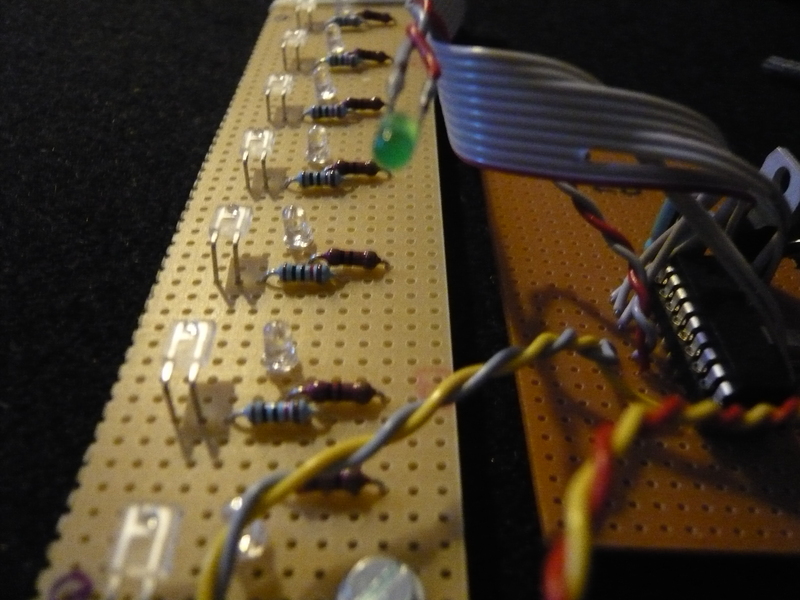 As optical input devices I chose the LPT80 photo-transistors connected over a voltage divider to the AD-inputs. In order to light up the scanned surface, I used some white Led’s, one per used phototransistor and lined up in parallel. 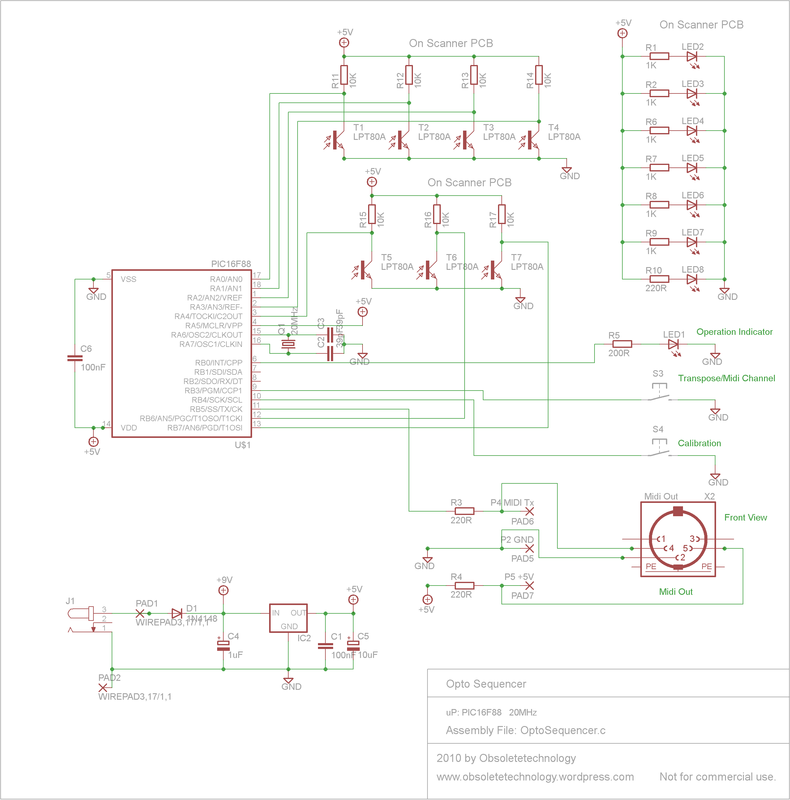 You can download the schematics, C-Code and compiled hex file from here. 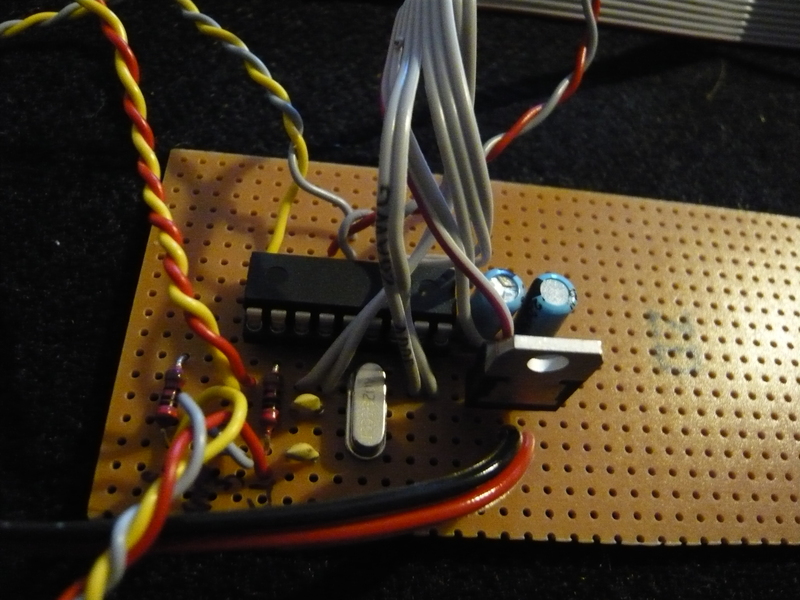 The microcontroller is setup to scan the individual analog inputs at a regular interval and compares the values on the analog inputs to a user-presettable threshold value for white respectively black background. Based on this evaluation, the uC the outputs a Midi Note On/Off message, depending on which change just occurred. Since there are 7 inputs, the system will also output 7 different Note values, one for each input. The analog input scan rate is controlled by the uC Timer0 which generates an interrupt at each timer elapsed, where the ISR routine performs the AD conversion and processing. This way a constant sampling rate is guaranteed. The Timer 0 prescaler bits are all set to 000 which means that (from the 16F88 datasheet) we are using a prescaler value 1:2. The timer 0 is incrementing on each second instruction cycle and counting up to 255 where it generates an interrupt. Since we multiplex between the 7 inputs of the AD-converter we will end up with a sampling rate of 9803Hz/7=1400Hz per channel. Furthermore, the interrupt interval of 102us will allow us to execute 510 instructions inbetween, so we have to take care that the code executed inbetween 2 interrupts is not longer than that. Now we need to see if at a sampling rate of 1400Hz we are able to detect a moving object with some 10mm of size. 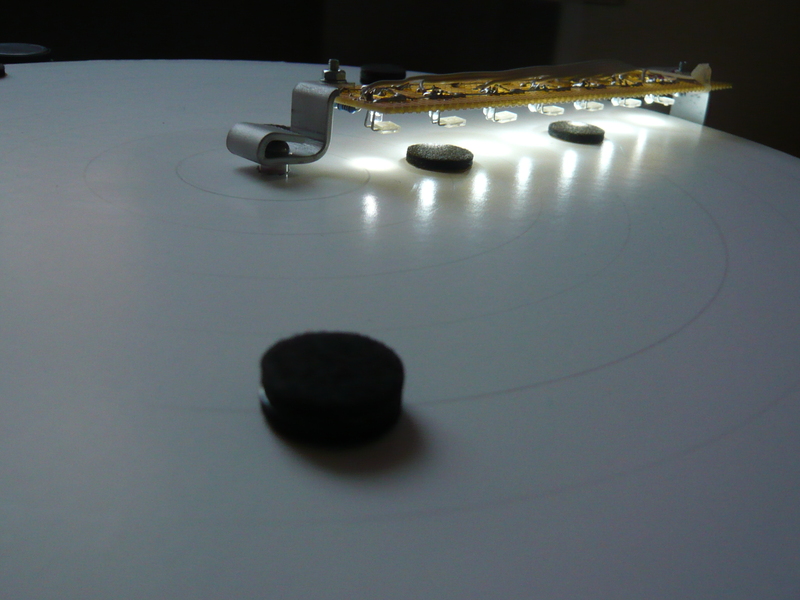 (Remember, we want to detect black felt dots on a white surface turning on a turntable platter). 27 points is not a lot but will be sufficient for a good detection. Midi Channel Select, changes the midi channel the note values are broadcasted on. Note Transpose, midi notes can be transposed up to 2 Octaves up (via Pushbutton). Input Level Calibration, this feature is used to set the threshold levels for analog input level change detection, which is useful when working under different lighting conditions or if the phototransistors have a large difference in collector current. For those who are interested, here some parts of the code for a quick lookup. The complete code can be downloaded below. All code has been written in HitechC. if(thrFlagArrayH[channel] == 0) // Has already been set previously? // in order to set the threshold values to the current setup.